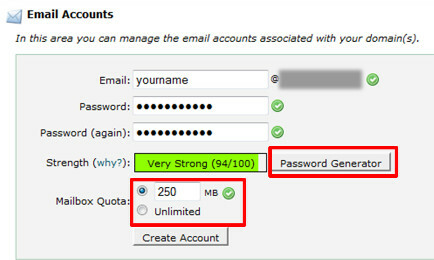 3) Enter your new email account username and password as shown below. Note: You can enter your own password or choose a randomly generated password by hitting the “password generator” button. For mailbox quota, you can choose “unlimited” or either setting your own disk size. Disk space is allocated in Megabytes. Press “Create Account” to confirm changes. 5) After this is complete, click the Go Back button. You should see your new email account at the Table below. 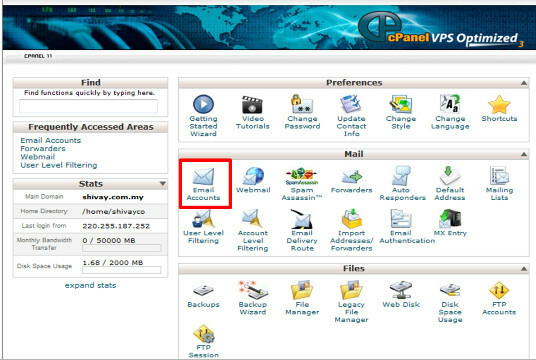 You can now access your webmail by clicking on “Access Webmail”. Alternatively, you can set up your own Microsoft Outlook 2007 or Windows 8 Mail Applications email accounts and access from there.